Direct Messaging is not email or text messaging. 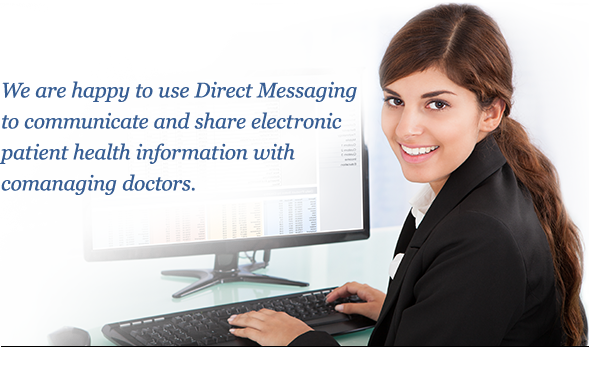 Direct Messaging is a secure, internet-based communication tool that can replace mail and fax transmission of protected health information (PHI). If you have access to Direct Messaging through your electronic health record (EHR) system, we would like to receive and share patient data via this fast and efficient technology. Click here to view our Direct Messaging FAQs and learn more about this secure, HIPAA compliant communication system. What are PCLI’s Direct Messaging addresses? Unless Direct Messaging communication is required with a specific PCLI doctor, kindly use our facilities’ general office addresses. Copy and paste the appropriate address into Your Direct Messaging system. Click here to view a PDF of PCLI's Direct Messaging address book. Or click here to download an Excel file. If you have any questions about Direct Messaging with PCLI, please contact Amy Jerome.